Welcome to the Wairarapa Branch of the New Zealand China Friendship Society. Members are drawn from throughout the Wairarapa Region, with several members living in the Wellington area and others working in China. Wairarapa is the 16th Branch of NZCFS, being inaugurated in 2001. Most meetings are held in Masterton, on average every second month (usually on the 4th Wednesday evening). A number of our NZCFS members are also members of the Masterton District Council’s International Relations Committee which meets at 4pm on the third Wednesdays of most months. 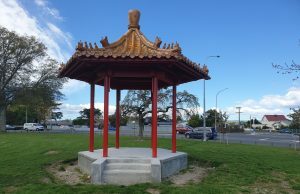 Wairarapa Branch welcomes teenagers as well as young adults interested in modern-day China to join with retired people, many of whom have worked and travelled extensively throughout China. To find out more about any Wairarapa Branch activities please email Donald Simpson. Annual membership Fees: $20 for an adult worker; $15 for a pensioner or unemployed person; $30 for a Family (2 or more at the same address); $50 for a Corporate Member. To join the NZCFS Wairarapa Branch: please complete the online membership application form below. Please fill in the form below to join the Wairarapa Branch of the New Zealand China Friendship Society Inc.
(including your name and the word "Membership" in the reference fields).